The RiverDogs are proud to partner with The Boeing Company to celebrate our troops and veterans throughout three special military nights during the 2019 season. On Saturday, May 25, Monday, July 1 and Friday, August 2, the RiverDogs will open our gates and hearts to the men, women and families of the armed forces. During Military Appreciation Nights soldiers and their families are recognized for the dedication, commitment, and sacrifices they have made for our nation. Show your support for those who fight for our freedom and join us. The Hero of The Game program is a season-long commitment made by the RiverDogs and The Boeing Company to pay tribute to local military personnel and their families. During each home game, a veteran or active duty military member and their family will be honored for their commitment and sacrifice. As the Hero of the Game, honorees and their families are treated to the Riley Park Club experience, recognized on the video board and through public address with a description of their contributions to our country. Red Shirt Fridays are a community-wide initiative and a way for the RiverDogs and fans to show solidarity with area military personnel and veterans. Red Shirt Fridays incorporate recognition of Veteran VIP's as part of each Friday night fireworks display. RiverDogs staff and players wear specialty red shirts and uniforms during all Friday home games. Fans wearing a red shirt may receive $1 off regular ticket pricing at the Box Office or have the opportunity to donate that dollar back to support various Veteran's Non-Profit groups in the Lowcountry. During an inning break at every Friday home game, a deployed military serviceman, servicewoman - - or veteran unable to attend the game - will be called and thanked by all in attendance for their service. The Veteran VIP program features a custom-made PROUD VETERAN lapel pin, co-branded RiverDogs and Boeing. Pins will be available to veterans at the MUSC Health Fan Services booth during each home RiverDogs baseball game. Veterans wearing the pin will be asked to stand for recognition during the National Anthem, receive special recognition on Red Shirt Fridays, Military Appreciation Nights and during Hero of the Game. Veterans wearing the pin will also have access to various VIP experiences at The Joe. A new, single, black seat in Joseph P. Riley, Jr. Park will be on display throughout the season. The "Chair of Honor" will be a permanent fixture and will serve as a tribute to prisoners of war and soldiers who are missing in action. A plaque with the following inscription accompanies the "Chair of Honor" at Joseph P. Riley, Jr. Park. "The unoccupied chair is in honor of those who are still prisoners of war (POW) or missing in action (MIA) and symbolizes that there will always be a place in Joseph P. Riley, Jr. Park awaiting their return. God bless you. God bless America." 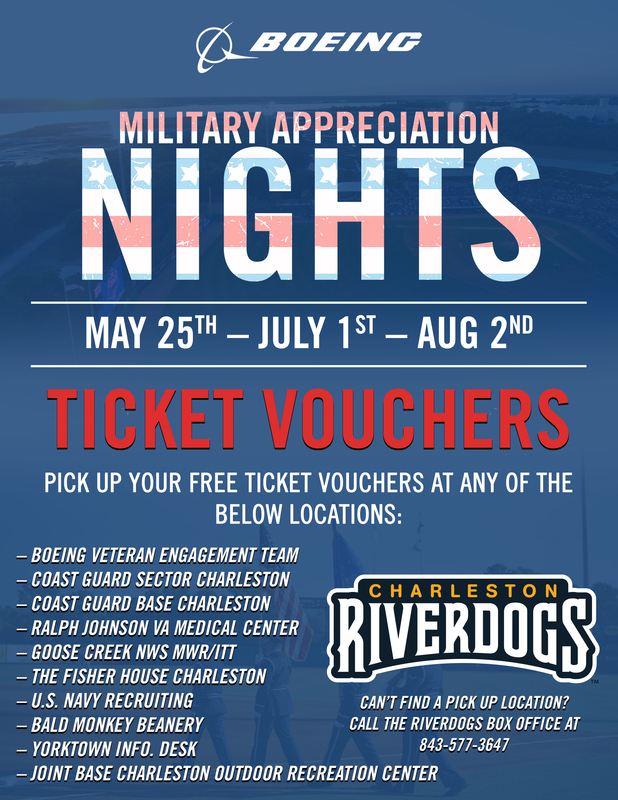 The RiverDogs offer a $5 military discounted ticket which is available at Joseph P. Riley, Jr. Park Box Office all season long with proof of active-duty, reserve, veteran, dependent and retired military status. Subject to availability. Military Season Tickets are available at $4 and $5 per seat. Benefits include: 10% off merchandise discount card, ability to exchange unused tickets for general admission tickets, invitation to all season ticket holder events throughout the year, can purchase up to four tickets at this price.